My real-food, Paleo-eating, health-conscious friends should look away for this post. Because today, I'm sharing with you the recipe for my homemade macaroni and cheese, a dish so bubbly with cheesy goodness, the mere mention of it triggers spontaneous praise from my children. It's one of their favorite dishes, and when Corey is on the road, I may even serve it and call it dinner. Can you come closer to the screen? I feel the need to whisper. The thing is, it's not really a from-scratch sort of thing. In fact, it begins with a box of Kraft Deluxe Macaroni and Cheese, which appears to have enough orange food dye in it to make us all glow like Lorax. I am not proud of this, so I keep it a secret; some might say I live in denial. But I do know there's a fair bit of stirring and measuring and pouring, despite its questionable origins. And wholesome ingredients like cheddar cheese and sour cream are added to the processed cheese sauce. So it's practically homemade, right? One bite, and it won't matter anyway. Not even to Michael Pollan himself. 1. In a 1.5-quart casserole dish, whisk together the hot water, pepper and cheese sauce from the box. Ask for forgiveness for using cheese sauce from a box. 2. Stir in dry pasta from the box. Note to self that dry pasta always comes from a box, so this can't be all that bad. 3. Stir in 1 cup of the shredded cheddar cheese. Reflect that cheddar cheese is real food; wipe all thoughts of step one from your mind. 4. Cover casserole with lid; bake at 375 for 25-30 minutes. Carefully remove casserole from oven, stir in the sour cream, sprinkle with the remaining 1/2 cup cheddar cheese and the Panko crumbs. 5. Bake another 10 minutes, uncovered, until bread crumbs are golden and macaroni is bubbling. 1. 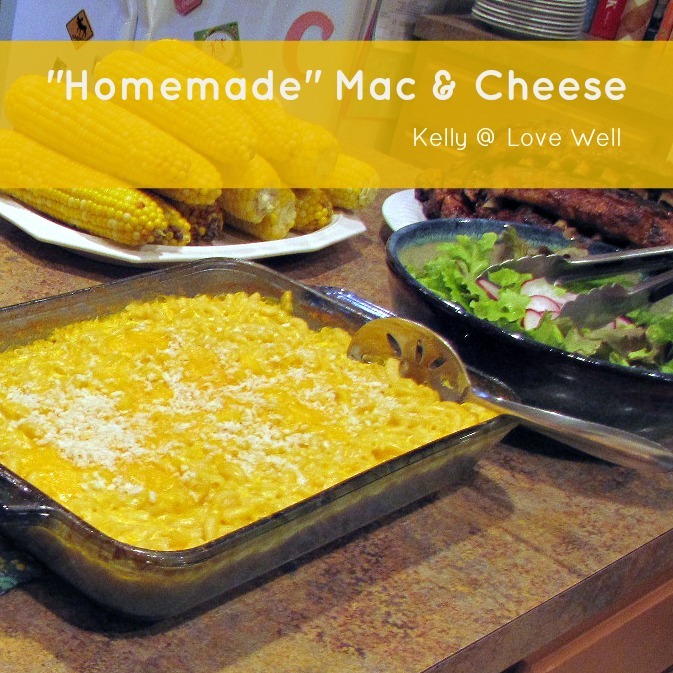 Kraft makes several variations of Deluxe Mac and Cheese. Any of them will work, but I think the original is the truest version. 2. I often use a mix of cheddar and jack cheese instead of pure cheddar because it happens to be what I have in my fridge. It's still wonderful, but it does tamper with the intense cheese flavor a bit. You've been warned. 3. As noted above, you can swap Greek yogurt for sour cream. The end result will be richer and tangier; good for adults, maybe not so palatable for kids.